Fresno commercial properties need local service. Flooding and water damage events at Fresno commercial properties are often complex with numerous issues that require a knowledgeable and flexible response. Whether we’re dealing with a relatively small water cleanup scenario or a large-scale event, we work quickly to assess each unique situation and isolate the damaged area. In many instances, normal operations can continue in a temporary space while we restore your facility. 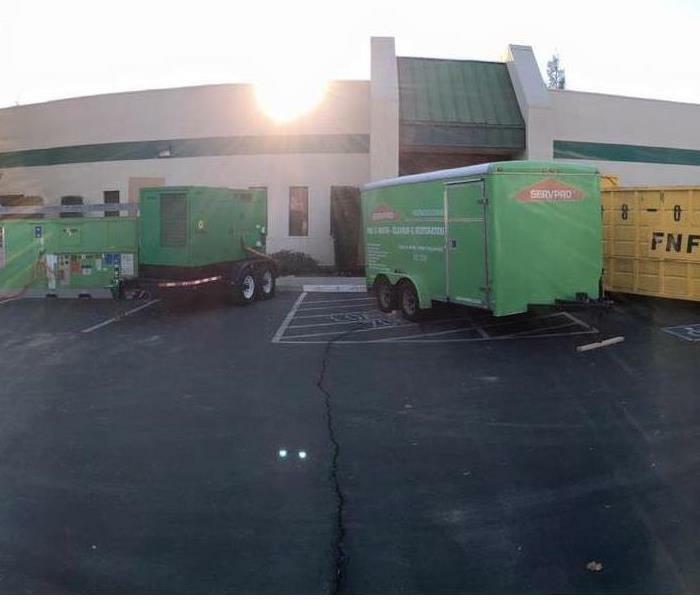 SERVPRO of Fresno Southeast specializes in the cleanup and restoration of commercial and residential property after a water damage event. Our staff is highly trained in property damage restoration. From initial and ongoing training at SERVPRO’s corporate training facility to regular IICRC-industry certification, rest assured our staff is equipped with the knowledge to restore your property. With SERVPRO of Fresno Southeast we can handle your emergency from start to finish when disaster strikes. With a complete general contracting division, we are able to replace or rebuild any of the materials that were not able to be restored or saved after mitigation services are complete. We can handle anything from that new flooring replacement or painting project all the way to a full rebuild of a total loss structure after a fire. We are accustomed to helping with the insurance portion of the claim dealing with your insurance adjuster to ensure that all tasks are accounted for in the adjuster’s allowance so your home or business is restored to its preloss condition. When choosing one vendor to handle the job from start to finish it enables us to move fast to get your life back to normal without delays or headaches. When you have a small leak or a little bit of water that is left unattended to it can turn into a BIG problem. One of the most important factors that can turn a little water damage into a mold issue is time. When materials are left wet for an extended period of time the situation can deteriorate very quickly. We lose the opportunity to restore items affected by the water damage and often have to change gears into a removal process due to the affects of time. Mold is a scary word when it comes to your home or business, the good thing is that mold is avoidable with a fast response to water damage. This is why we are on call 24/7 to respond to your water emergency so we can prevent mold from ever happening. If the water damage was not found and mold has started, we are equipped with the trained staff and equipment to clean it up "Like it never even happened." Commercial properties needs are quite different from residential, here at SERVPRO of Fresno Southeast we have a full commercial property division dedicated to the unique needs of our commercial clients. We understand what is important to business that have an emergency, DOWNTIME is critical to minimize for a business and can make or brake the ability for some to survive. We understand this and will work around the clock 24 hours a day if needed in rotating shifts to get you business up and running again. We will tailor our tasks to your specific needs, if you need us to work at night so you can be open for business during the day, we can accommodate that. Whatever it takes we are here to help you get back to normal operations as quickly as possible. Serving Fresno, Ca. and the entire Central Valley. 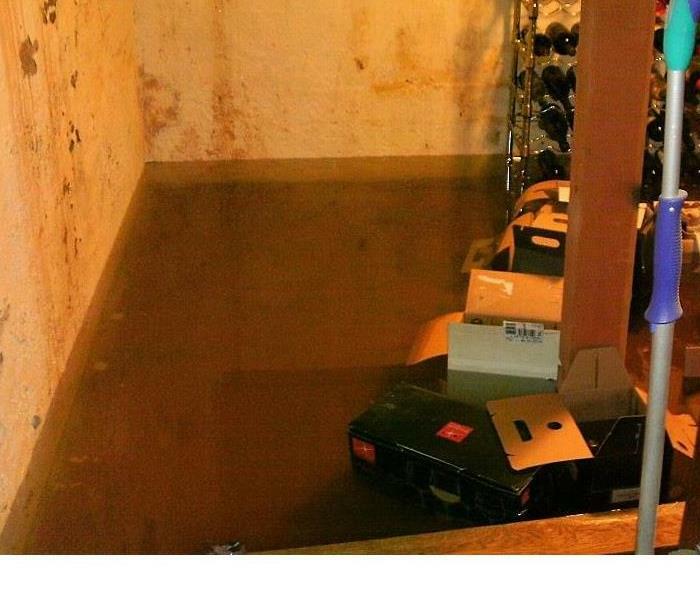 Fresno County Residents: We Specialize in Flooded Basement Cleanup and Restoration! The bottom line: a flooded basement can jeopardize your health, safety, and your home’s integrity. It’s worth making a call to SERVPRO of Fresno Southeast and let our trained, professional crews handle the situation safely and correctly. We have earned the trust of hundreds of homeowners, business owners, and property professionals. Mold found in a closet. SERVPRO of Fresno Southeast specializes in mold cleanup and restoration, in fact, it’s a cornerstone of our business. Our crews are highly trained restoration professionals that use specialized equipment and techniques to properly remediate your mold problem quickly and safely. Flooding and water damage is very invasive. Water quickly spreads throughout your home and gets absorbed into floors, walls, furniture, and more. SERVPRO of Fresno Southeast arrives quickly and starts the water extraction process almost immediately. This immediate response helps to minimize the damage and the cleaning and restoration costs. SERVPRO of Fresno Southeast specializes in the cleanup and restoration of residential and commercial property after a fire, smoke or water damage event. Our staff is highly trained in property damage restoration. From initial and ongoing training at SERVPRO’s corporate training facility to regular IICRC-industry certification, rest assured our staff is equipped with the knowledge to restore your property. Does Your Fresno Home Have A Mold Problem? 4/11/2019 - Fresno commercial properties need local service. 10/17/2017 - Fresno County Residents: We Specialize in Flooded Basement Cleanup and Restoration! 9/14/2016 - Does Your Fresno Home Have A Mold Problem?